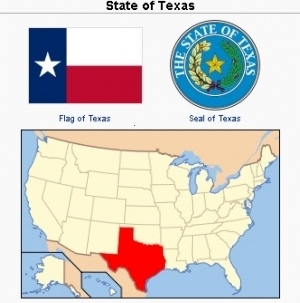 Texas, the second largest state in both area (268,820 square miles or 696,200 km2) and population (23,904,380 in 2007) in the United States, located in the south-central part of the country, is bounded on the south by Mexico and the Gulf of Mexico. In 1958 it ranked first in the number of cattle raised, and first in number of farms, which produced wheat, cotton, rice, sorghum, oats, as well as many vegetables, fruits, and nuts. Petroleum was the leading industrial product. The agricultural opportunities as well as the mild climate of the southern part of the state attracted Mennonite settlers to Texas as early as the first decade of the 20th century. The Mennonite Yearbooks of 1905-1908 listed a Mennonite preacher Bernard Kroeker of Richmond, near Houston in Ford Bend County. He had 7 members of the Nebraska and Minnesota Evangelical Mennonite Brethren conference, who held their services in a schoolhouse. By 1905 Mennonite Church (MC) settlers arrived in the Tuleta area in Bee County, approximately 60 miles northwest of Corpus Christi. The 1907 Year-Book listed Peter Unzicker and D. S. King as preachers of this settlement. In 1957 this church, Tuleta (MC), had 10 members. E. S. Hallman was long pastor and bishop here. In the same general area northwest of Corpus Christi is Calvary Mennonite Church (MC), near Mathis, with a membership of 66 in 1957. This congregation was an outgrowth of mission activity launched in 1946. Forty miles (65 km) west of Corpus Christi in Alice was a Mennonite mission (MC), started in 1958. A third MC mission, located in Corpus Christi, was started in 1956. 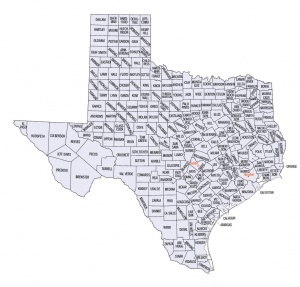 A second center of Mennonite settlement is in the Premont area, approximately 50 miles (85 km) southwest of Corpus Christi and approximately 100 miles (165 km) northwest of the extreme southeastern tip of Texas. The Mennonite Brethren moved into this region in 1927 and organized the Premont Mennonite Brethren Church, which in 1952 had a membership of 53, plus a Mexican chapel with 7 members. Other Mennonites moved into this area in 1928, establishing the Falfurrias congregation (MC), now known as La Gloria, with 25 members in 1957. Between Laredo and Brownsville along the Rio Grande River the Mennonite Brethren established a flourishing chain of 7 missions with a total of 271 members in 1952 as follows: Chihuahua at Mission 72, Grulla 52, La Casita at Garciasville 28, La Joya Chapel at Mission 6, Los Ebanos 74, Lull at Edinburg 15, Mission City Chapel at Mission 24. All the mission churches in southeast Texas worked chiefly among the Mexicans. Two Mennonite churches were located in the northwest part of the state, near the boundary of the Oklahoma panhandle. The Perryton Mennonite Church (MC), which in 1957 had a membership of 50, was begun in 1943. The Bethel Mennonite Church (General Conference Mennonite), in the same county at Waka, had a membership of 18 in 1957. Thus the entire Mennonite membership for Texas in 1957 was 500. Between 1957 and 1987 membership in Texas Mennonite churches more than doubled, growing from 500 to more than 1,000. Eight congregations affiliated with the Mennonite Church (MC) had a membership of 282. A Conservative Mennonite Conference congregation in San Antonio had 33 members. Five congregations dually affiliated with the General Conference Mennonite Church (GCM) and the Mennonite Church (MC) in Dallas, Fort Worth, and Houston had 174 members. The Houston Chinese church (GCM) had 28 members. Eight Mennonite Brethren congregations had 241 members. One congregation was dually affiliated (MB, MC) and had 35 members. A congregation in Paris (42 members) was affiliated with the Mid-West Mennonite Fellowship. Three unaffiliated Mennonite congregations had 44 members. Two Brethren in Christ congregations numbered 49 members. A Beachy Amish Mennonite congregation of 61 members and a group of German-speaking Mennonites from Mexico and Canada near Seminole (1977) with ties to the Evangelical Mennonite Mission Conference (62 members) completed the roster. Employment opportunities in dairy and poultry farming attracted Old Order Amish families to the areas of Gonzales, Boling, and Dublin between 1980 and 1983. Many of the Amish intended to work just long enough to acquire funds for purchasing farms in their home communities located throughout the Midwest. Not all families regarded their stay in Texas as temporary, however. The three communities, totaling 42 households, appeared stable and permanent. ARDA: The Association of Religion Data Archives. "State Membership Report: Texas, Religious Traditions, 2010." Web. 1 January 2014. http://www.thearda.com/rcms2010/r/s/48/rcms2010_48_state_name_2010.asp. Esau, Anna Hiebert. What God Has Wrought. Winnipeg and Hillsboro: Kindred Press, 1988. Friesen, John A. "Field of Broken Dreams: Mennonite Settlement in Seminole, West Texas." Journal of Mennonite Studies 14 (1996): 97-141. Gracy, David B., II. "Mennonites at Littlefield: An Instance in the Colonization of the Texas Plains." Mennonite Quarterly Review 42 (3) (July 1968): 184-192. Hilton, David. "Journey to Freedom: The Story of the Texas Mennonites." Texas Historian 48 (3) (January 1988): 7-11. Horsch, James E., ed. Mennonite Yearbook and Directory. Scottdale: Mennonite Publishing House (1988-89): 42. Kuvlesky, William P. "Ethnic Subculture and Social Change: The Case of the Old Order Amish in Texas." Paper presented at the Annual Meeting of the Southern Association of Agricultural Scientists, Biloxi, Mississippi, February 1985. Kuvlesky, William P. "Some Amish Move a Lot: The Old Order Amish in Texas." Paper presented at the 1987 meetings of the Southern Association of Agricultural Scientists, Nashville, Tennessee. Luthy, David. Amish Settlements Across America. Aylmer, ON: Pathway, 1985: 12. Gingerich, Melvin and Jenifer Hiett Umble. "Texas (USA)." Global Anabaptist Mennonite Encyclopedia Online. December 2008. Web. 18 Apr 2019. http://gameo.org/index.php?title=Texas_(USA)&oldid=143769. Gingerich, Melvin and Jenifer Hiett Umble. (December 2008). Texas (USA). Global Anabaptist Mennonite Encyclopedia Online. Retrieved 18 April 2019, from http://gameo.org/index.php?title=Texas_(USA)&oldid=143769. Adapted by permission of Herald Press, Harrisonburg, Virginia, from Mennonite Encyclopedia, Vol. 4, pp. 694-695; vol. 5, pp. 878-879. All rights reserved.